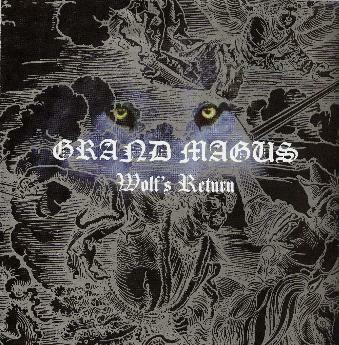 Grand Magus - "Wolf's Return"
Grand Magus are back and heavy as always. The opening track, "Kingslayer", has a huge and powerful sound and is a lot like the Spiritual Beggars last two efforts. It is mainly this song that reminds me of SB. I love the production sound on this record and the fact that all the songs tell interesting medieval stories. One of JB's strengths as a songwriter is that he comes up with catchy heavy riffs but he never forgets the melodies. "Nine" reminds me very much of Candlemass. "Blodörn" is a short piece that leads into the title track which has a very doomy headbanging riff. "Blood Oath" speeds things up and tells a cool story and is a bit like Manowar at times. "Järnbörd" is a short acoustic piece that leads into "Repay In Kind", a heavy fucker with JB really pushing the range of his voice. Cool guitars on this one. "Hämnd" begins with a bass line (like Cronos would play) that leads into "Ashes", a very Doomy number. "Light Hater" is a very powerful melodic track. This stuff is best when cranked up! The CD ends with "Wolf's Return part II", a short instrumental. A great CD. Enjoy!